I have always had an obsession with quirky trends from fashion history, and one of my favorites is a late 18th-century fad that used a row of small triangles to decorate the borders of gowns, hats, and shoes. I have seen modern historians refer to this design feature as "sawtooth" trim, but the the English fashion magazines from this era always refer it to as "Vandyke scollops" - named after the large pointed lace trim that was common in the works of the 17th century Dutch artist, Anthony Van Dyke. This style of trim seemed to be quite popular for about 20 years, and it not only reflected the Georgians' love of sartorial historicism during this period, but it also was a surprisingly easy and cost-effective decorative technique. With just a bit of scrap fabric, a seamstress could create eye-catching and fashionable embellishment on an otherwise simple dress. 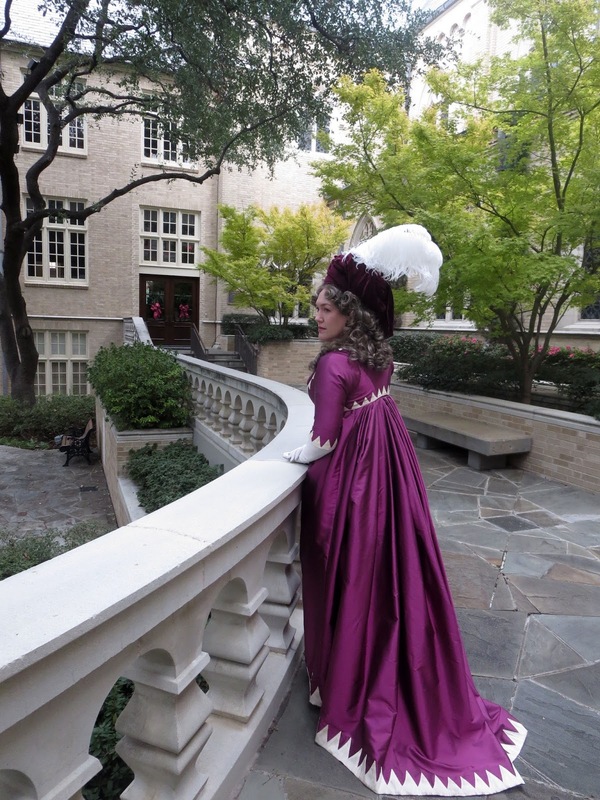 This past summer, I found myself in need of a new gown to wear to the Gala at Costume College, so I decided to make a new silk round gown and matching sleeveless spencer with Vandyke scollops. 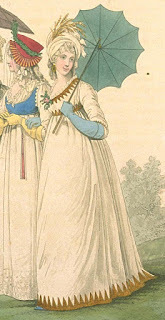 I based the construction of my dress on this Italian round gown and spencer from the Met, although I did change a few details, such as using shorter sleeves and raising the waistline so that it better matched the Gallery of Fashion illustration from 1796 shown above. 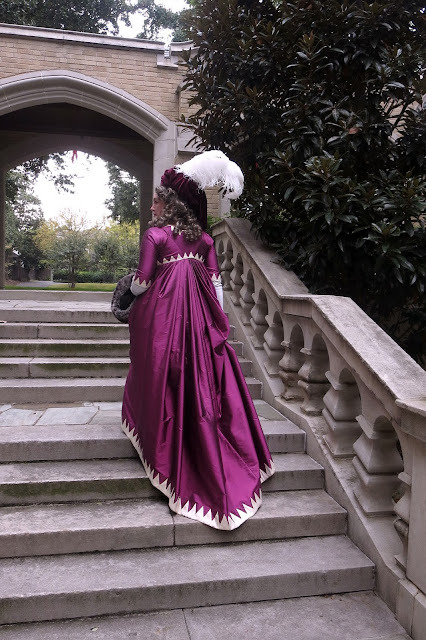 I was quite fascinated by the construction of this Italian gown's bodice, since it seemed to feature flaps that are gathered up on cords in the front. 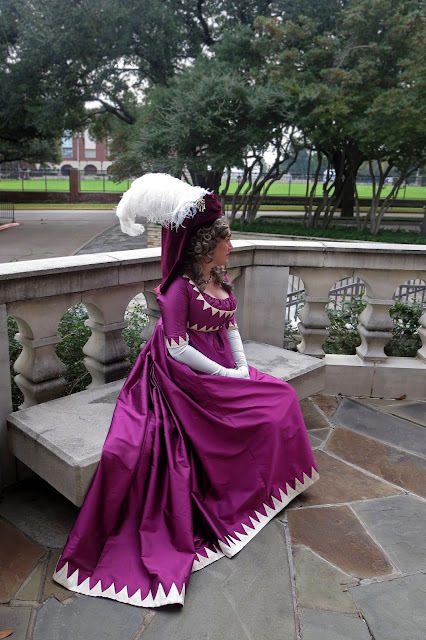 Most round gowns from this period have the bodice and skirt all in one piece, but in this gown, you can see that the bodice is more heavily gathered that the skirt, which would help to fine-tune the fullness of each piece. 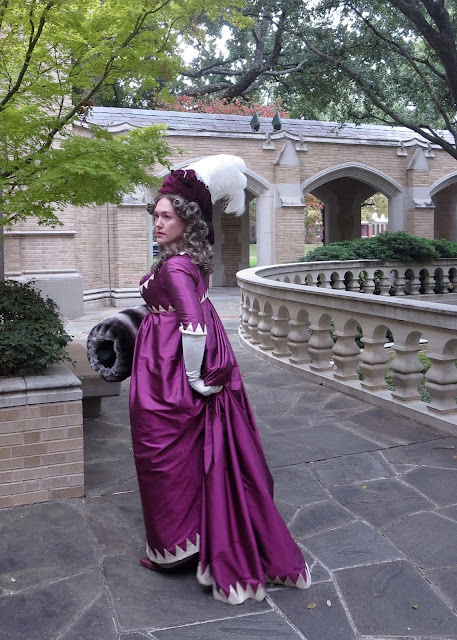 Although there aren't enough photos to tell how the original bodice is constructed under the flap, I used an educated guess and decided to make a lightly gathered bodice attached to the skirt, and then a heavily gathered section to cover it. This type of double-layer construction would also explain a few surviving gowns with odd flappy bits at the sides that museums never seem to know how to style. 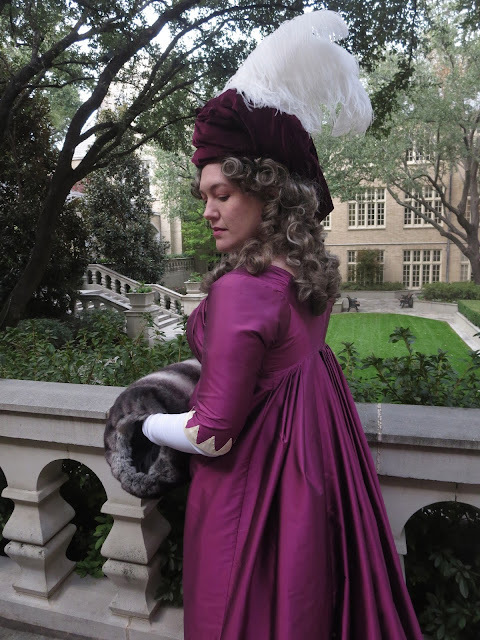 The Vandyke trim is quite bold - especially on the front of the spencer - and while I do like quirky fashions, it's nice that I can also wear the dress without the spencer for a slightly less busy look. I am wearing this dress with my transitional stays, a taffeta petticoat, an old velvet turban, and my new muff. 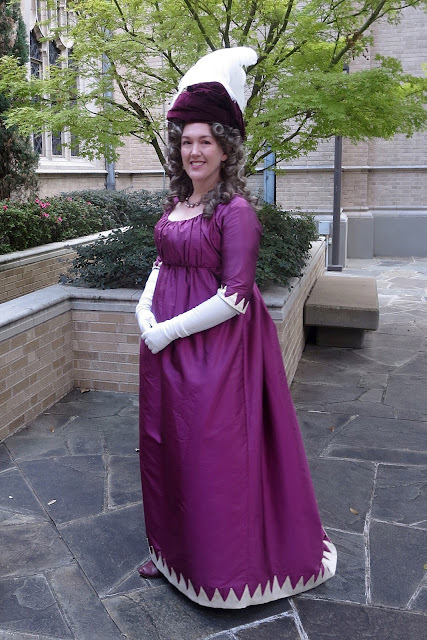 As usual, 1790s fashions tend to not be the easiest style for modern audiences to appreciate, but for some reason I adore them! The skirts are so full and the waists are so high that it does create a very odd silhouette, but when these outfits are all put together with the right accessories, I think they feel so glamorous and dramatic - especially from the back! If you'd like to see more photos of this outfit, you can find them on flickr. It was utterly splendid in person and looks even prettier in the daylight! Love it! I love this era! Beautiful! Stunning as always, Jen. I love how you work so much on the details. Love love love! So striking - the color of the dress with the contrast "teeth" is fab. Plus a genius bit of experimental archeology (so to speak, haha) there with the bodice flaps; I suspect you may have hit upon the answer to all those sad droopy flaps on museum dresses! Amazing and beautiful as always. It's nice to see your regular posts again. Oh man, you're so right--what a dramatic back! This gown is gorgeous, and I really love the way the spencer looks. This is an absolutely beautiful gown and spencer!! 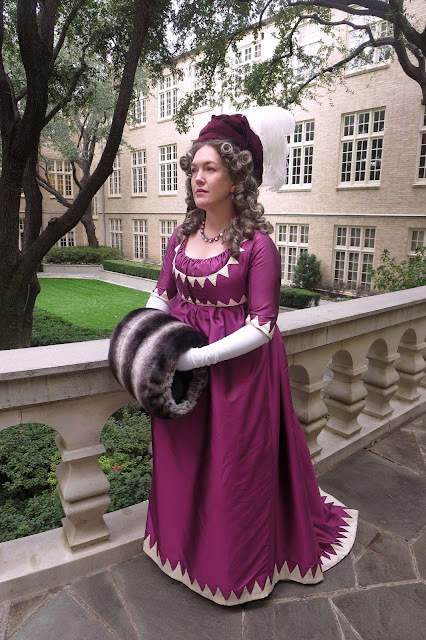 I am completely obsessed with 1790s fashions; I know I'm probably in the minority, but I just find the overall look of it insanely elegant and glamorous. It's always fun to see how various eras have interpreted and incorporated prior eras' fashions into their style. Bravo!! Funny- a friend ofmine is making something with triangualr decorations, and I told her I don't Think I've seen anyone do it Before. Well, now I have! You look gorgeous! Round gowns are interesting; they seem to be the classic example of a dress that looks like "nothing" on a hanger, but is spectacular in wear. I really love yours. What a striking gown! I love it! Magnificent! You look just like a fashion plate. I absolutely adore this style too - I think the silhouette is wonderful, as is this gown of yours. 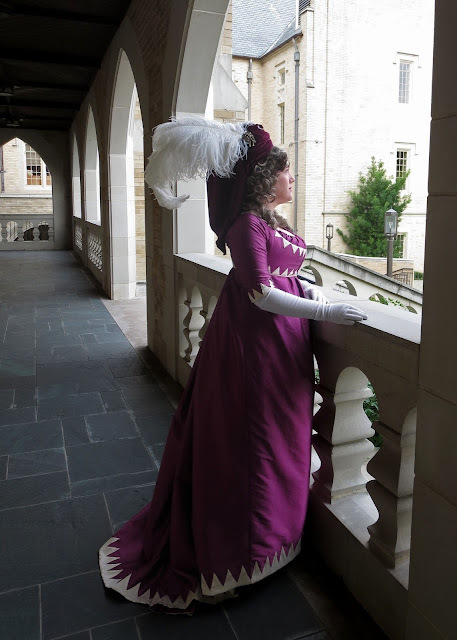 Your 1790s creations make me want to attempt something of my own more than anything else. Ooh! Ooh! Ooh! How did I ever miss this post! Seriously! Everything about this dress screams EPIC!!! 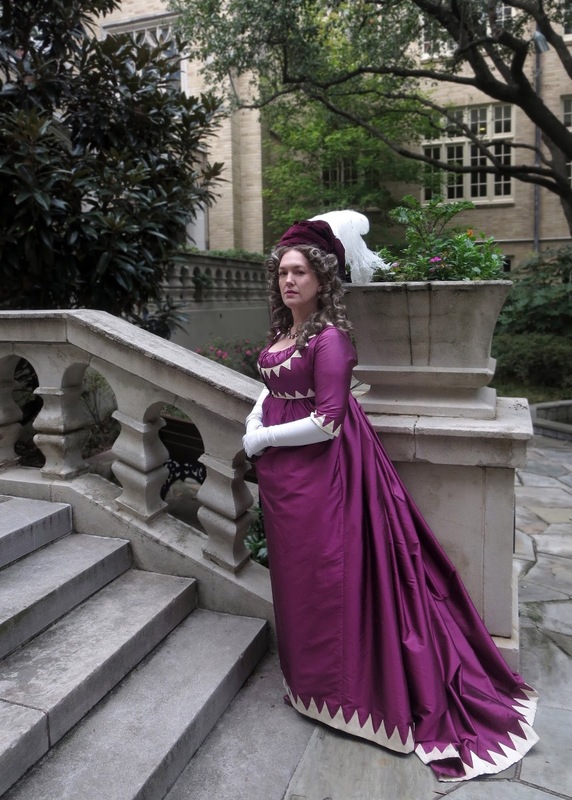 The color, they draping, the Vandyke scallops! Your hair! The turban! The muff and your gloves! I am so in happiness with this post!! I really appreciate the topics you post here. Visit our website if you are looking for Top 10 web hosting providers, Top hosting companies in usa, Top web hosting companies, best web hosting providers. Thank you for sharing a part of great information which is really helpful. good day!